Starting our journey to Peru’s Manu Wildlife Reserve, we boarded a tiny plane at the Cuzco airport. We watched the dramatic descent from Cuzco’s 3000 meter altitude, to the steamy jungle below, at just a few hundred meters altitude. Near Cuzco, the landscape was dotted with the occasional Inca ruin. Topography changed and unfolded before our eyes; craggy mountains gave way to vegetation, which grew thicker as the land got flatter. Finally, it was just a green, fuzzy, impenetrable mass of vegetation. 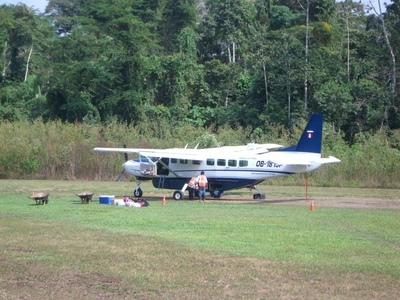 That’s when, looking out the front window, we glimpsed the tiny landing strip, carved into the jungle. After a smooth landing, we were enveloped by warmth and humidity; new sensations after weeks on the Altiplano. The thatched roof hut set the record for the most spartan airport we’d seen, and I felt a little reticence just setting off into this random jungle. But meeting our guide, Jose Antonio, inspired some confidence. Along with Jim and Patty, fellow explorers from Connecticut, we took a long boat upstream to the camp. The strangely gothic forms of clinging vines enveloping dead trees lined the river, and water birds fished on the shore. The Inka Natura camp itself was quite luxurious, for being isolated in the middle of a dense jungle. Private standalone bungalows were sealed against insects with wire mesh, and had hot showers. I would recommend the place. Apparently, documentary crews stay in these quarters for filming, as they’re so close to the action, yet comfortable. Resting in bed, you can hear the car-crash clang of the macaw’s calls. They like to nest near camp, as they feel safe there. 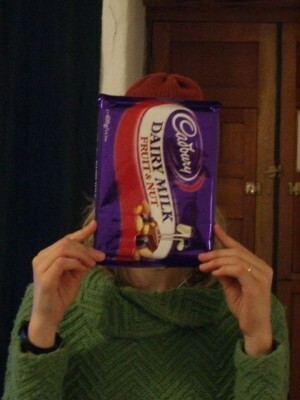 I’d provisioned with a bar of chocolate the size of my head. Meals at the camp were tasty and healthy. We tried some new Peruvian delicacies there, like causa, a delicious dish that looked like a roll cake, but was made of mashed potatoes with filling (in this case tuna). All in all, staying at Manu a few days helped me feel a little better, as I was pretty upset after Saffron’s passing. It was warm and full of life. Our photos of this amazing adventure are not so amazing though. We realized we´ll need to take something much better than a point and shoot camera on subsequent wildlife trips. So, there are no mammals, some blurry bird shots, and a lot of insects here. On several walks with Juan Antonio, we saw multiple species of birds, plants and some mammals. 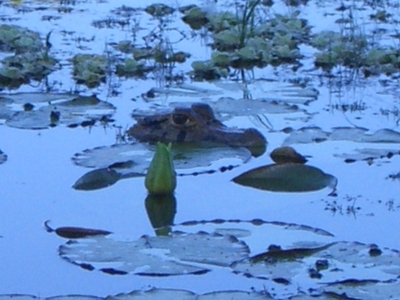 Manu Wildlife Reserve is supposed to be just about the most biodiverse place in the world. A total of five species of monkeys crossed our path, including Red Howlers; Black Spiders; Saddle-back Tamarins; and Brown, and White Faced Capuchins. At one point, two peccaries crossed our paths — peccaries are small, smelly jungle pigs. Several species of toucan squawked above, and we saw and heard at least two types of woodpecker, well, pecking. There were many hummingbirds as well. Many types of insect nests were on view. One giant tree, forty minutes or so away from camp, had a lookout platform on top, 25 meters high. 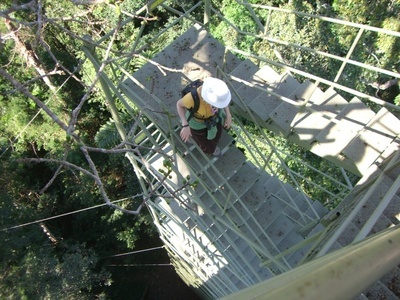 We climbed a rickety metal spiral staircase, to reach the platform’s view of the forest canopy. A birder from a separate group was up there with us, and we all saw a few interesting birds, including some kind of fly-catcher thing. I guess I will never be a real birder. Sweat bees (yes, apparently there are sting-less bees that eat sweat) began swarming around us, for obvious reasons, and we left. 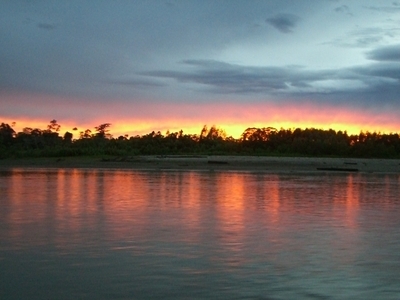 Early one morning, we boated to an oxbow lake, where a family of giant otters sometimes hunts. 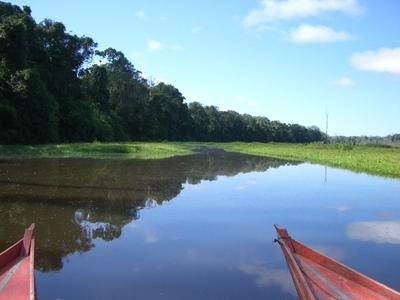 Oxbow lakes are created when a river changes course a little, leaving a depression where water still gathers. We glided silently on a primitive catamaran — two wooden rowboats with a platform on top, pushed by two oarsmen. 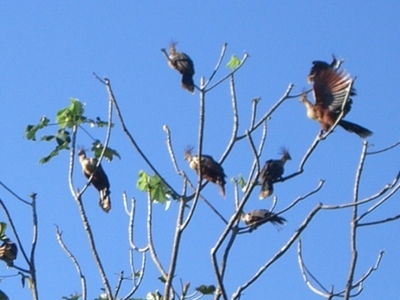 Many hoatzin squawked from shore; they’re big primitive birds that evolved long ago. To me, they look like a phoenix should, or something out of Greek mythology with big metallic feathers. The photo, of course, doesn´t do them justice. Blue lizard scales line their eyes, and they sound like they’re breathing fire. But when hoatzin move, they’re incredibly clumsy. The only reason more predators don’t eat them is that their meat tastes rancid, thanks to their primitive digestive system. A lucky break. There were also many other water birds, as well as hawks, vultures, etc. Seeing a screamer reminded us of those we’d seen in the Ibera Wetlands, in Argentina. We spied a few caimans. A splashing in the distance was the otter family. As we passed, they "telescoped," bobbing their heads out of the water, and turning toward us. This was our cue to back off, as the otters were a bit distressed. We watched from a distance, with our binoculars. It was a family of five, some of them about two meters long. They were thin and incredibly flexible. Sometimes one would catch a fish, hold it in a paw, and crunch it down loudly in about two minutes. My friend Dan asked if their "giantness" detracted from their cuteness. Only, I suppose, in the fact that they have giant sets of teeth, like a big orangutan might, and that they make very strange calls, like a cat-baby hybrid yelling alien words at you (I don’t know whether other otters share these characteristics). We were very lucky to have seen them, as they’re endangered from over-hunting. Sand flies nibbled us as the sun got hotter, and we pushed back to the dock. Another day, on another oxbow lake, we saw a single otter, who’s looking for a mate. And the otter family played in the distance. Beside the second oxbow lake was another ancient tree with a canopy lookout even higher than the first one — 35 meters. From the top, we could see a capybara bathing in the distance. Though they were easy to find in Carlos Pellegrini, Argentina, capybaras are a rare sight at Manu. While swaying in the top of the tree, we contemplated the unsettling fact that none of the trees in the forest have roots deeper than several feet. It seemed a wonder that this giant hadn’t toppled. 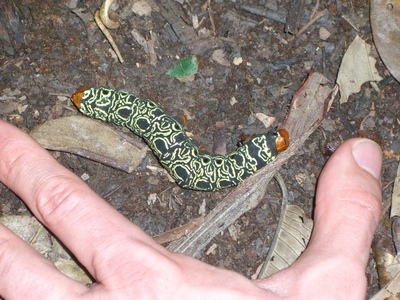 It had fin-like roots, like this much smaller specimen. Many experiences at Manu really reminded me of a nature documentary, which makes sense. 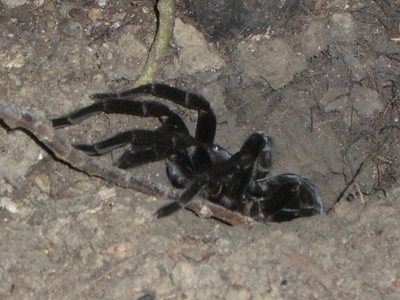 One such time was during an evening walk, when Jose took us to tarantula’s nest. He gently poked a stick into the nest to roust the spider. She finally came out to chase out the stick, and was definitely the size of a small hand. We saw several other species of large and/or deadly spiders at Manu as well. 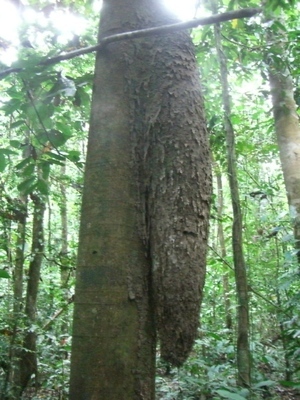 The forest was alive with insects everywhere we turned, including many species of giant ants. 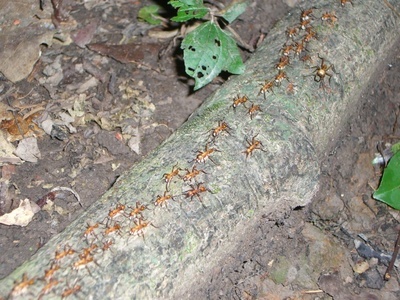 Army ants are especially interesting, in that they are considered a top predator in the forest. Nothing messes with them. Army ants don’t have permanent nests, rather, they create bivouacs out of live ants from the group, and go on systematic raids for food. There are actually species of birds who have evolved to follow the army ant raids, and feast on any insects fleeing the swarm. In fact, birds of multiple species flock together to do so, and are called "mixed feeding flocks." Birders seem especially keen on these flocks. The highlight of our bird experience was the parrot and macaw clay-lick. Early one morning, we boated and hiked to a short cliff of red clay, which was a shore of the river. Waiting for birds, we at our breakfast, hidden in a large blind. Squawking green parrots flew around in the trees above the clay-lick, before deciding it was safe to descend. They clung to the wall, eating small pieces of clay from it. 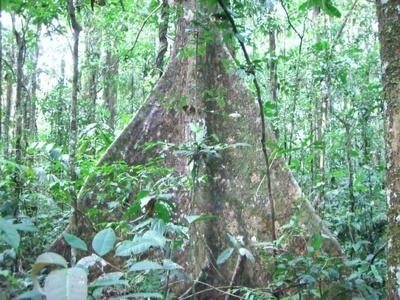 Clay is an important part of jungle animals’ diets, as it helps them digest. Clay-licks are also social areas, "bird discos," as Jose called them. 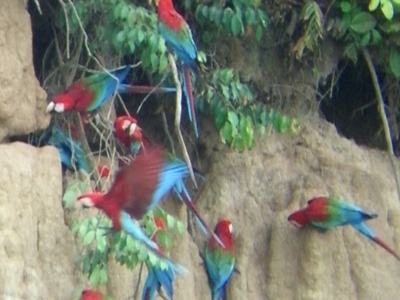 After the parrots had their fill, macaws cautiously descended from the trees. 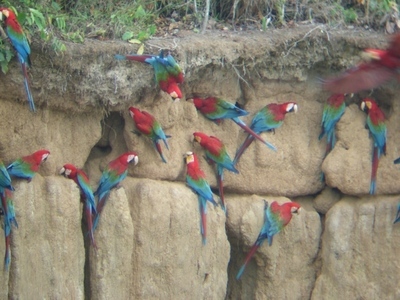 While at Manu, we saw several types of macaws; the ones at the clay-lick were red and green. It was incredible to see so many macaws on the lick — about eighty. They mate for life, and were there in family groups, sometimes nuzzling each other. It was also a surprise to see how gracefully they flew. Wonderful and smart birds. That night, there was a serious thunderstorm, with wind and water blowing through the mesh of our shelter, and loud thunder. Our next clay-lick experience was less successful, probably because of the thunderstorm and a full moon. Before dusk, we hiked forty minutes to the tapir clay-lick. The blind was extensive — a raised shelter with many mattresses protected with mosquito nets, above the clay-lick. We ate a little chicken and rice for dinner. Lounging on mattresses, in complete darkness, we quietly awaited the shy mule-sized creatures. Snorts, squawks and rattles pierced the night, while Jose shone a red light around the clay-lick. Tapirs cannot see red light. It was very peaceful. After waiting several hours, we finally gave up on seeing the tapirs that night. While Jose glimpsed one or two in the trees, they just didn’t feel safe enough to come out. 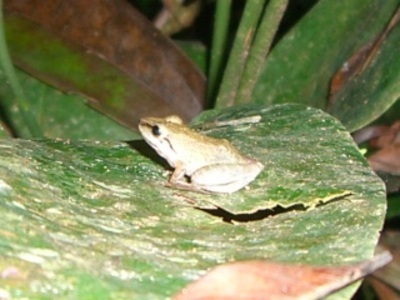 On the hike back, we heard some monkeys, and saw several brightly colored species of frogs. 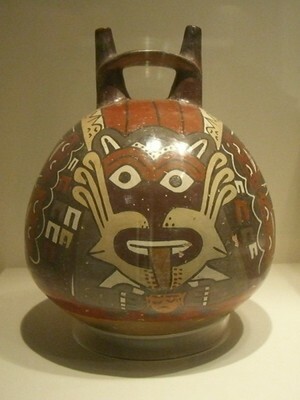 In my opinion, Nasca pottery is some of the most interesting Pre-Colombian pottery in the Americas. It´s bold and graphic, with bright, solid colors, bordered by black lines, and features fantastic gods and creatures. And it´s at least 1000 years old! 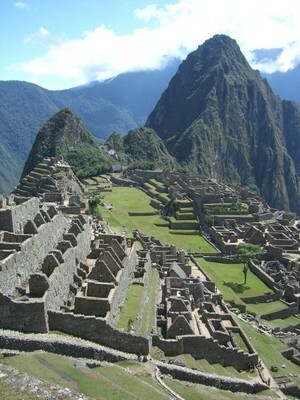 Machu Picchu is one of those sites that defies description in words or pictures, like Angkor Wat or Uluru. To get there, we boarded a train at Cuzco; the only one we’d ride in South America. It zigzagged up switchbacks to climb a mountain as it left town. Then, it descended smoothly through a narrow river valley, between towering mountains. The whole railroad must have been quite a technical feat. At one point, I looked out the window, and was surprised to note we were surrounded by dense jungle — hanging vines and chaotic greenery. Quite a change from the austere Altiplano, and in less than an hour. Altitude really influences temperature, and what can grow in a place. 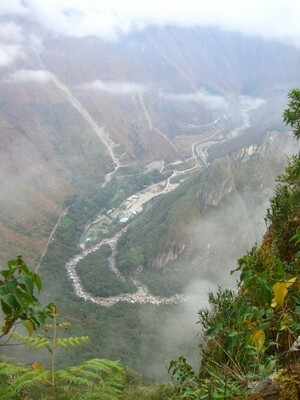 After several hours, we pulled into Aguas Calientes, the little town that serves as base for visitors of Machu Picchu. Looking around, we were surrounded — boxed in — by these amazing high jungly mountains that almost looked volcanic, but weren’t. They reminded me of some of the grandest landscapes of Hawaii. What’s sad is that Aquas Calientes looks like an old west-style shanty-town. It’s a hastily slapped-up tacky place bent on making the quickest buck, in the middle of some incredibly majestic scenery. We headed to the town’s hot spring later that day, and took a dip in sulfur-smelling (and looking) warm pools. Lots of tourists and locals had the same idea. The next morning, getting up at five, and boarded the bus for Machu Picchu. The bus proceeded to scale one of the aforementioned, ridiculously steep mountains, on a road composed entirely of switchbacks. The sun was rising as we reached the top. 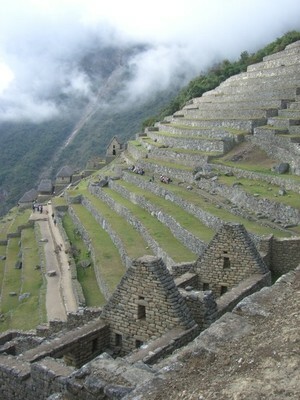 Machu Picchu was shrouded in clouds that morning, and gradually revealed itself as the sun burned through. It was a particularly dramatic way to see the site. Location is one of the most impressive things about MP. 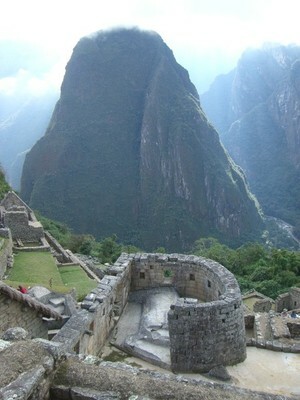 Basically an Inca pleasure palace atop a high mountain, it is composed of a massive amount of stone. The stone was all hauled up an incredibly steep, tall mountain, covered in thick jungle, and bordered by a river, by people with no horses or oxen. 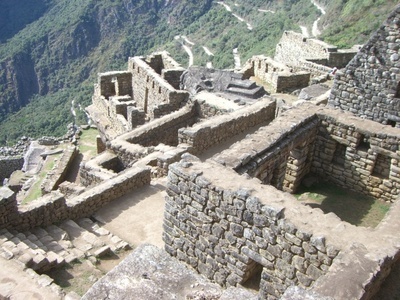 After clearing the jungle at the top of the mountain, the Incas proceeded to build a large and architecturally ambitious palace. And the top of the mountain isn’t even that big. Many times during the day, it struck me that, with one wrong step, I could plunge into the canyon, never to be seen again. So many people must have died just laying the stones. After climbing terraces to the top of the site, we relaxed for a while and watched llamas munch grass. 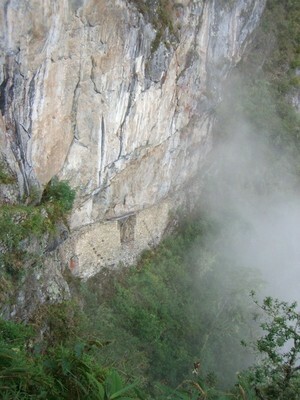 Then we followed a mysterious trail marked "Inca Bridge" for about half an hour. On this trail, we were often on a very narrow cliff-side path, with no railings. 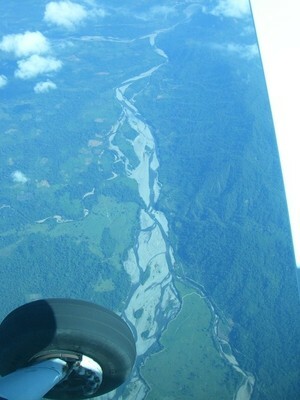 There was nothing to our right except a valley so far down that it resembled the view from a small aircraft. Arriving at the Inca Bridge, it defied reason. These people really loved to climb. This was basically a very large, sheer cliff, at the top of a very tall mountain, that they’d somehow built a path against. And when they ran out earth or rock that could be carved into path, they piled stones on the narrow strip of earth below to form a bridge. It’s hard to convey what they did, or the scale and danger of this site. We obeyed the "Do not enter" sign festooned with skull and crossbones, and went back to the main site. To give an idea of scale, there must have been hundreds, if not thousands of people visiting Machu Picchu that day, and that was before the afternoon rush. But often, we felt alone with the ruins. We didn’t have a guide that day. It was good to go at our own pace, but we didn’t learn the significance of every detail. Temples took a variety of shapes, including this curved one. Inside, it incorporated an existing rock from the site, which the Incas carved into an alter. 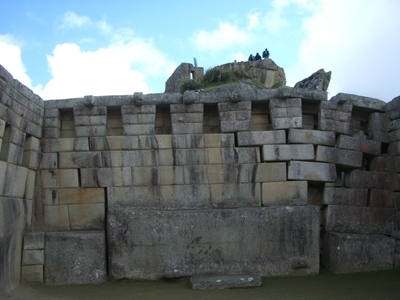 The quality of stonework varied depending on the function of the structure — whether it was a temple or storage area, for instance. Below is some of the finer stonework. At one point, we saw a viscacha. 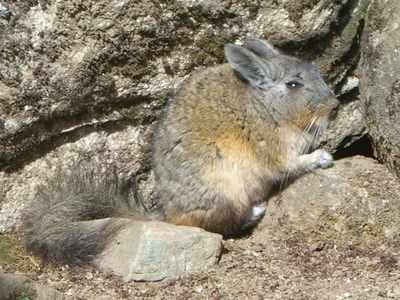 We’d seen a different variety of viscacha in Bolivia, so it was fun to compare. On the ride down the mountain, a little boy in an "Inca" costume kept appearing in front of our bus. We’d turn down another switchback, and there he’d be, waving furiously. He was running down the mountain, at top speed, catching up with our bus on every pass. Amazingly, he accompanied us all the way down the hill, then boarded the bus, panting. He couldn’t have been older than seven, and was looking for a tip. We were amazed by his feat, and gave it. Later, we realized we probably shouldn’t have, as he’s probably forced to perform this dangerous stunt daily, and our tip could only reinforce that. These have been a very sad couple of days for me. 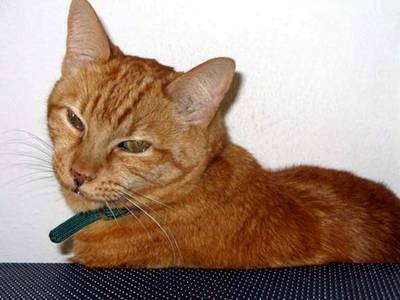 The day before yesterday, I learned that my beloved cat Saffron had passed away. As I write this in Aguas Calientes, Peru, enormous, conical, jungle covered mountains loom outside the window. Deep in a narrow gorge, I´m surrounded — the mountains are less than a football field away on all sides. And I feel trapped, like I want to leap over the mountains and run back to NYC. I can´t really believe he´s gone. Saffron was my faithful companion for thirteen years. I adopted him in Corvallis, Oregon; he climbed into right my coat at the animal shelter. Saffron accompanied me to Detroit, for graduate school; to Amsterdam, for a stint at an advertising agency, and finally to New York, where we´d live for eight years. We shared a Soho apartment the size of a walk-in closet, and a polluted Nolita apartment, before moving to a comfortable Brooklyn brownstone. He made every apartment feel like home. This has been a truly wonderful eight months of traveling with Jason. And while I´m very excited to come home, see my family, and start our life together, there will be something missing. While it has been incredibly painful to lose him after I haven´t seen him in ten months, I am comforted by a few things. Eva, who cared for him while I was away, has been incredible. She spoiled him so much, we often joked that he must be having another caipharina after his daily massage. Eva is grieving too, and I´m grateful Saffron received the best care possible with her. I know he enjoyed staying with her, and having a chance to play with her cat Shadow. He had some very good times with them this year. It´s also a relief that Saffron didn´t suffer, he probably died of natural causes. While I´m on the subject, I should also say thank you to my friend Jill, who took good care of Saffron years ago, during part of my time in Detroit. I´m grateful to have had so many wonderful years with Saffron, and for the way he made my New York existence so much more fun. He is missed. Cuzco must have been very beautiful in Inca times. 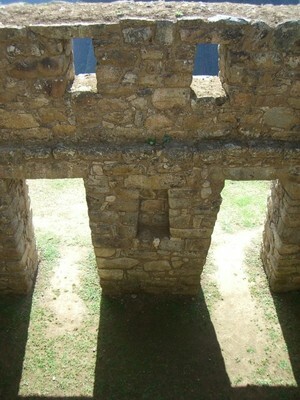 Much of the city was composed of fine stonework; flat, interlocking stones with no space between. No one knows how they did it. The Spanish wrecked all the buildings, leaving only the foundations and some partial walls. They then built their own structures on top. The strategy was to demoralize the population, and stamp out their religion. This was partly successful. The combination of Inca and Spanish architecture was actually quite beautiful. Even our hotel had some Inca walls. 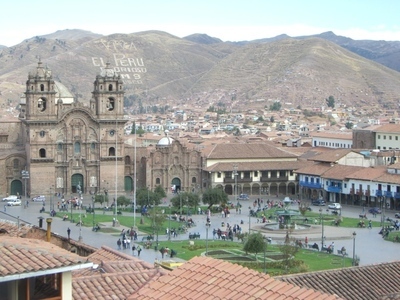 The cathedral was located on the site of an important Inca temple. Some walls and even rooms of the temple remained, and it was really strange to see a building that combined so many Inca features with Renaissance architecture. It contained many paintings of the "Cuzco style." We were a little surprised by the paintings of Jesus breast-feeding with the Virgin. The architecture museum was quite good, and helped prepare us for the Sacred Valley of the Incas and Machu Picchu. 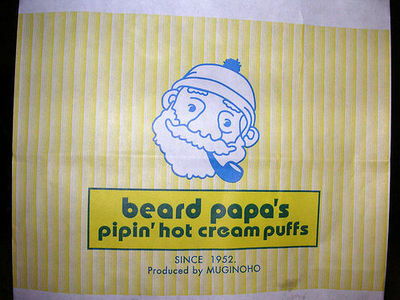 Local food was great. Favorites like corn pie, Aji de gallina (chili chicken in a creamy yellow sauce with walnuts), and alpaca steaks were hearty and filling. 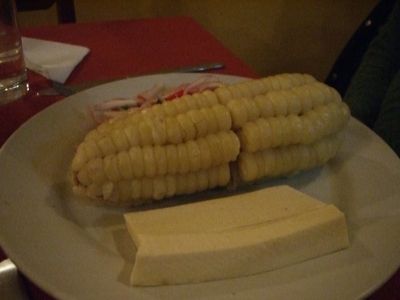 And there were many varieties of local corn — I ate this ear, which had really large, starchy kernels, like a mix between potato and corn. Like the kangaroo, alpaca and guinea pig also present the "pet it or eat it?" dilemma. Actually, with alpaca, one can also ask, "wear it?" 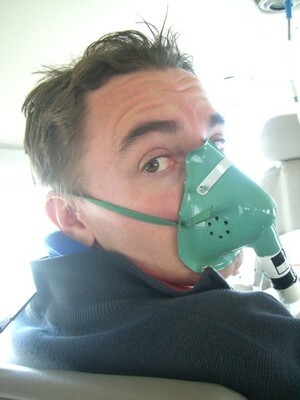 And yes, Jason did try the ¨cuy,¨ or guinea pig finally. Traveling through South America, we were often surprised that it was more difficult than Southeast Asia, for those not fluent in Spanish. In Southeast Asia, people are so determined to earn North American and European business that they’re learning all the English they can. In our South American travels, most people we’ve talked to haven’t known English. We theorize that there are so many Spanish-speaking tourists in South America, that those in service businesses don’t always need to learn English. However, Cuzco was different. Most people we spoke with knew some English. Also, there were tons of touts on the street, badgering us to eat at their restaurants. In Cuzco, like in, say, Chiang Mai, tourists can basically get anything they need — sunscreen, massage, banana pancakes, replacement backpacks. There were good and bad sides to all this. It was harder to have a normal interaction with locals, when the center of their town is a little like a gringo ghetto. But it was nice to be able to get proper eye drops, or a cappuccino. And I’m sure the locals feel that way too — it’s no fun to have your local square dominated by backpackers, but a boost to the local economy is always welcome. Near Cuzco is the Sacred Valley of the Incas, which includes multiple Inca temples and massive terraced farming sites (they were incredibly prolific). 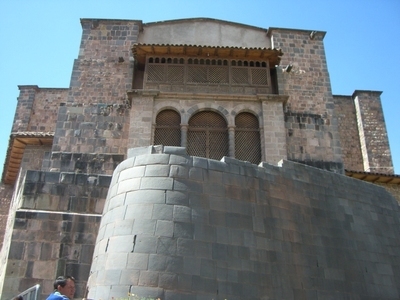 Inca architecture is fascinating because it combines geometric precision with a sensitivity to nature. Their buildings and landscape design have a minimal elegance, and the use of stone and plants humanizes it. They also worked with existing features of the landscape, to great advantage. 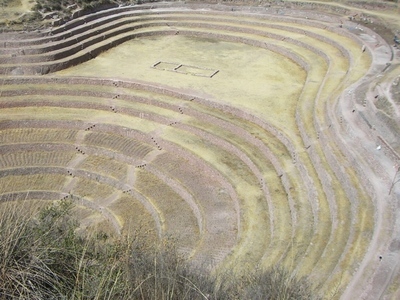 Moray was an amazing site that incorporated natural valleys into stepped, inverted domes. The large-scale geometric patterns were stunning. To give an idea of scale, those little diagonal lines were actually stair steps going from one level to another, which we descended. No one knows exactly what this site was used for, but it´s theorized Moray was an agricultural laboratory. The temperature lowers a full five degrees with each descending terrace, and they may have been simulating different agricultural conditions. 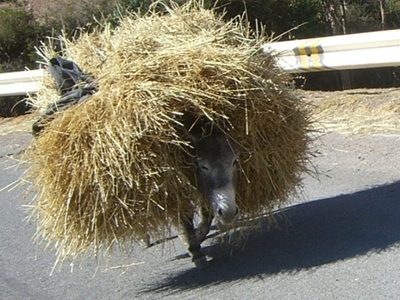 Looking like a porcupine-mule hybrid, a mule carried a heavy load. 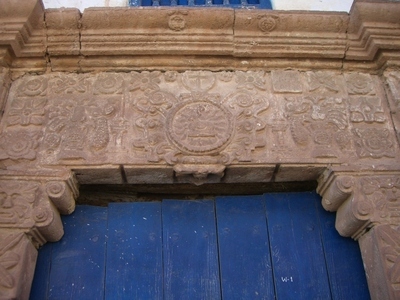 A nearby village had beautiful Spanish doorways. A small community´s livelihood was collecting salt from a salinated mountain stream. 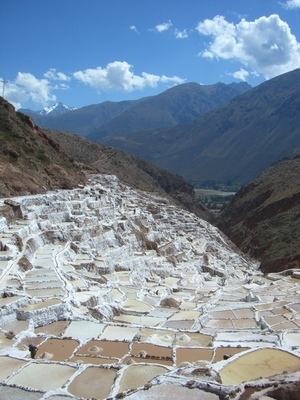 Each year they build hundreds of salt-collecting terraces down a hillside, and do the backbreaking work of collecting salt. 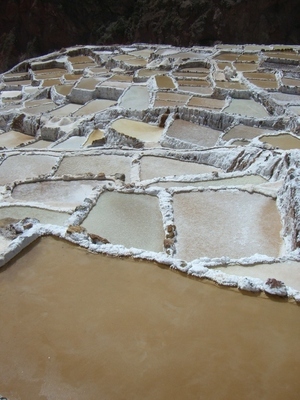 The terraces were so graphic with their white edges, and each had a slightly different color of water. We´ve encountered a lot of salt-collecting communities in South America, though the others were on salt lakes. Lunch was a surprisingly great buffet, in a colonial house. This fantastical flower was in the garden, with a bee trapped under the stamen (?). 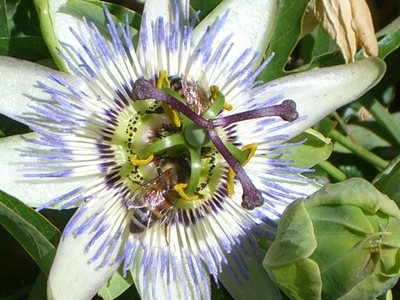 Jason assumed the flower was adapted to trap bees for a while, so they´d collect more pollen. Ollantaytambo was one of our last stops. 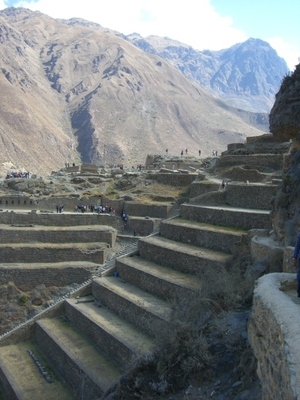 It was an Inca town, and these giant terraces were designed to protect the temple and royal residences up top. There were also temples to the sun and moon below. 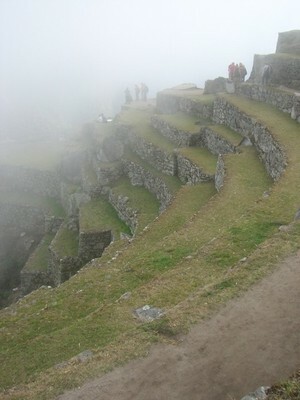 The view from atop the terraces was dramatic, looking down on the town, and across to a steep mountain. On the mountain were remains of more plebeian dwellings — the townspeople lived all the way up there. 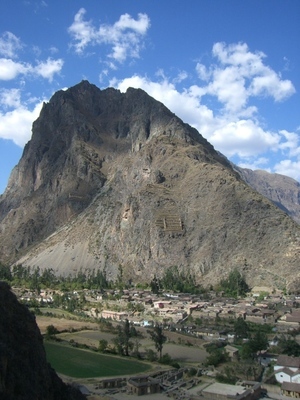 In Inca days, no one lived on the valley floor; it was too valuable to agriculture.